Milk is often referred to as a complete food since it is packed with calcium and nutrients, necessary for the growth, maintenance and development of the human body for all ages. Thick, creamy and naturally glossy in texture, fresh whole milk is unpasteurized and doesn't contain artificial coloring or preservatives. The glycemic index of milk is 27 which falls under low GI category and the glycemic load is 2.7. The glycemic load of 1 cup of milk is 2.7.The amount of sugar we have, directly affects our blood glucose levels. It is found in food items in the form of carbohydrates. These carbohydrates are broken down into sugar so that the body can use for energy. Milk contains a carbohydrate called as lactose which is converted into glucose and galactose and causes a rise in your blood sugar levels. While 1 cup of milk does contains 10 grams of carbohydrates, it is extremely good source of protein along with 65% of saturated fats, there won't be much rise in blood sugar levels. Milk is a very good source of medium chain triglycerides (MCT) which helps in functioning of the myocardium. Certain fatty acids found in milk has anti-inflammatory properties. The protein found in milk contributes in satiety. 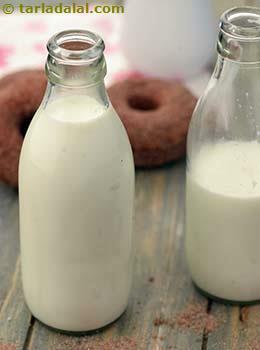 Milk is a good source of calcium and helps in improving insulin response. Is milk suitable for weight loss? Being a very good source of calcium, milk can help you lose weight. The reason behind this is calcium helps our body break down more effectively and thus aids in weight loss. 1 cup of milk provides 234 calories with 8.6 grams of protein and 13 grams of good fats. This makes milk wholesome and you will feel satiated for a longer period of time. Thus keeps your appetite under control. However anything in excess might lead to a several side effects. Hence, controlling portion size is important.